If you’ve ever owned an iOS device then you know the Guy George Hotz. One of the most popular hacker for Jailbreaking Apples iOS devices. Now he comes with a new tool called Towelroot. 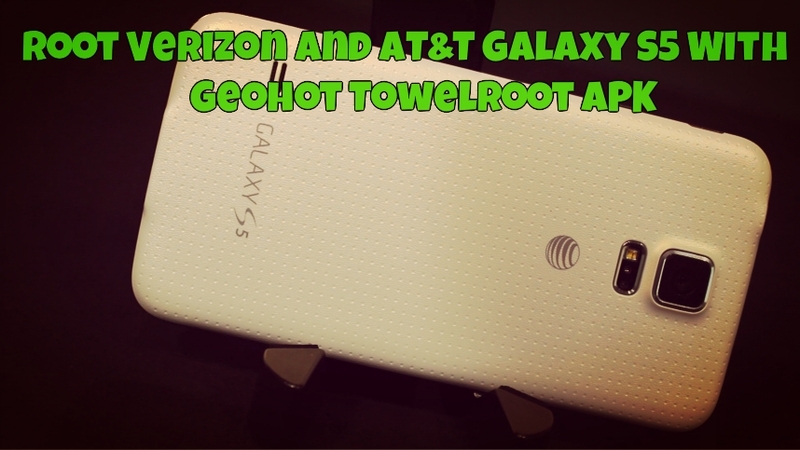 Which allows you to root the Verizon and AT&T Samsung Galaxy S 5 android smartphone. Galaxy S5 owners on AT&T and Verizon now can use this free tool and get the root access on the device. Once the device is rooted you can enjoy lots of benefits of rooting, like custom ROMS, rooted apps, install tweaks etc. THe process is very simple and easy, all you hvae to done is install the application on your device and run it once to get the root success. Not only this, as per the developer this tool is compatible with almost every Android device that has a kernel built before June 3rd, or you can say than any android smartphone running on Android 4.4.2 or lower. The app is tested and found to work with the AT&T Galaxy S5, Nexus 5, Galaxy S4 Active, and AT&T and Verizon variants of the Note 3. Geohot notes that installing this tool on your Samsung device with the Knox security system in place will almost certainly void your warranty, but if you want root that bad, you probably don’t care. As we mention above the rooting process is very simple and one of the fastest and easiest method to root AT&T or Verizon Galaxy S5. 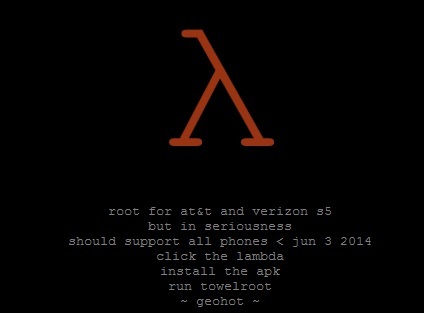 To install towelroot application on phone, head over to towelroot.com website and click the lambda to download the APK. Once the application is installed on your AT&T or Verizon Galaxy S5, run the application form the app drawer and all you need to do is click the root button. This will root you device within in few seconds. One last thing, if you come across any bugs, be sure to report them. 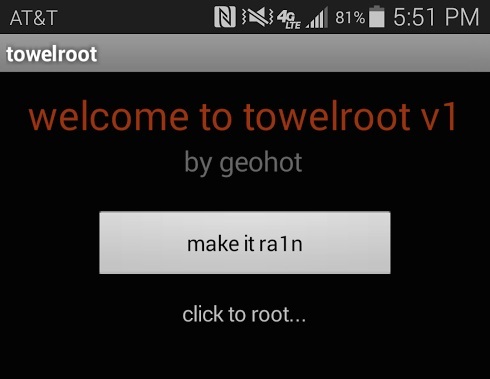 For more information head over to the XDA original thread and give towelroot a try.